Updated and easier to perform, this transposition effect with colored, foam, giant jellybeans teaches the importance of sharing. Great audience participation trick for character building shows. Based on an effect by Eric Lewis, and props made by his son Martin Lewis, David Kaye, aka "Silly Billy," has created a routine with laughs, participation and a final magical surprise. Imagine this: Two kids are invited on stage and each holds a colorful bag. 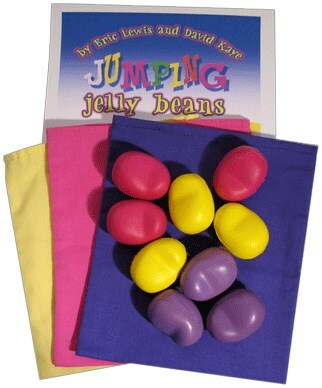 You place three yellow jelly beans, one-by-one in the yellow bag held by one child, three pink jellybeans in the pink bag held by another child and three purple jellybeans in your purple bag. Comedy ensues and then, to verify what is where, you remove one jellybean from each bag to finally be sure which colors are in each bag. Then a wave of the hand and a magic word shout out by the audience and… each kid takes out a purple, pink and yellow giant foam jellybean from his or her own bag. Here's a routine that has lots of fun, audience involvement, magical moments, and a presentation that encourages the importance of sharing. This trick is not mechanical. It necessitates some basic sleight of hand. But if you can do a sponge ball routine, then you'll be able to take your skills to the next level when you get the Jumping Jelly Beans for your next holiday show or to include in a character-building show for kids.